I come from a long line of Allergy & Asthma sufferers and it doesn’t help that we’re slightly allergic to our pets hair as well. Doesn’t he look happy as we sneeze around him. Small but mighty that little dog is. Needless to say we’re always looking for ways to improve our air in our home so we can decrease our allergy attacks and breath better. 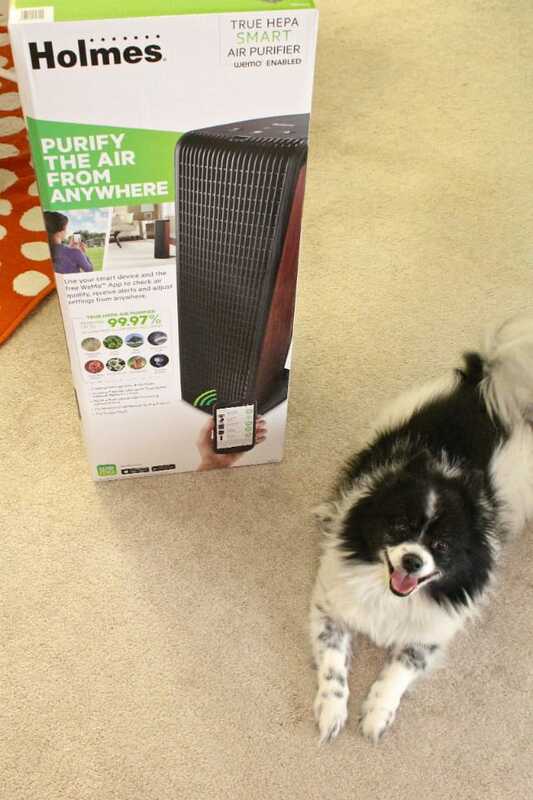 Thankfully we were just introduced to this fabulous Holmes® Smart Air Purifier with WeMo technology. 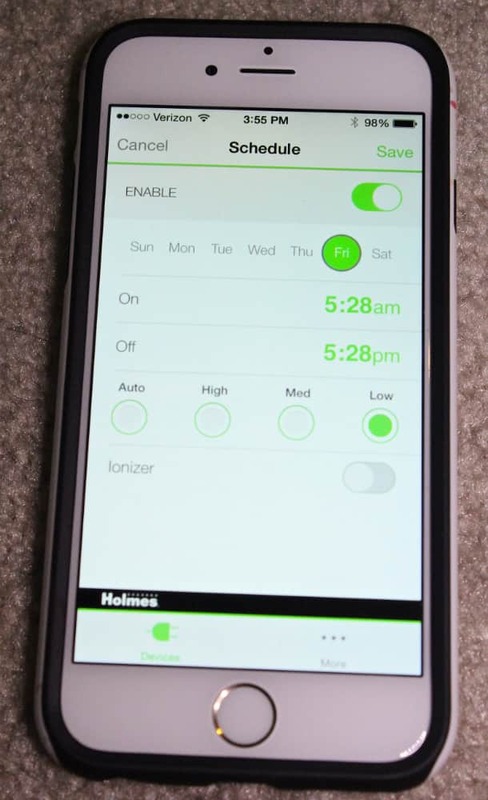 I’m actually very familiar with WeMo as I use it to control lights in our home. I had no idea you could control Air Purifiers with it as well. It’s pretty awesome and easy to set up as well. That’s always a bonus for me as I don’t want to spend hours setting up a piece of technology that is supposed to make my life easier. The instructions were very easy to follow. I inserted the 2 replaceable True HEPA Allergen-Remover filters that were included and plugged in the air purifier. True HEPA filtration removes up to 99.97% of airborne allergens including Pollen, Dust, dust mite debris, mold spores, pet dander and smoke/odor. In case you didn’t know! When you plug it in the triangle symbol that symbolizes the WeMo signal lights up. I love the wood like paneling on the side of this purifier as well. I just had to share that! I then moved on to setting up the air purifier with my WeMo app. You can download the app onto your smartphone. I have an iPhone so I downloaded it right from the app store. 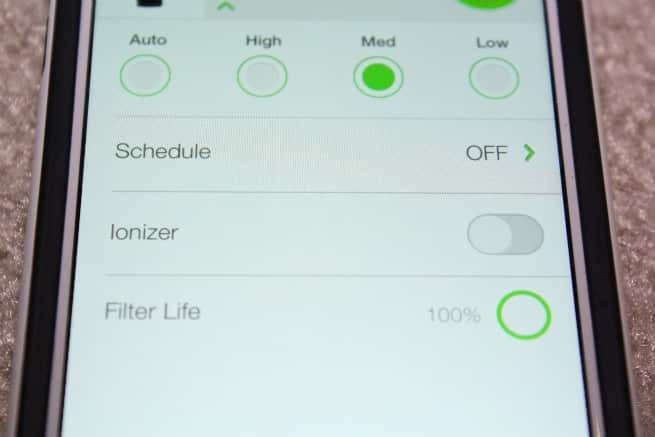 This app allows me to control, monitor and adjust my air purifier even when I’m not in the room using my smartphone. You can download it on a tablet as well if you prefer. 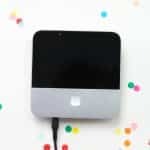 It’s fantastic as it allows me to purify our air from anywhere using your smart device. I don’t have to be home to make sure my air purifier is working. 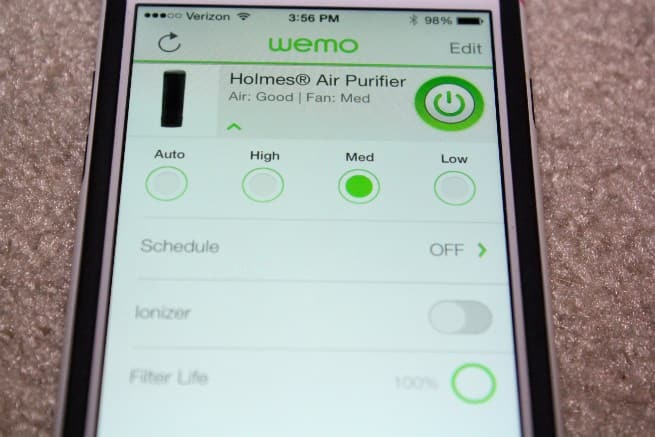 The WeMo app also notifies you when air quality is poor and when it’s time to change your filter. When you tap the circle in the top right corner of the app it turns green to show that the Air Purifier is on. When it’s not lit that means the air purifier is off. You can change the speed of the fan from auto to low. 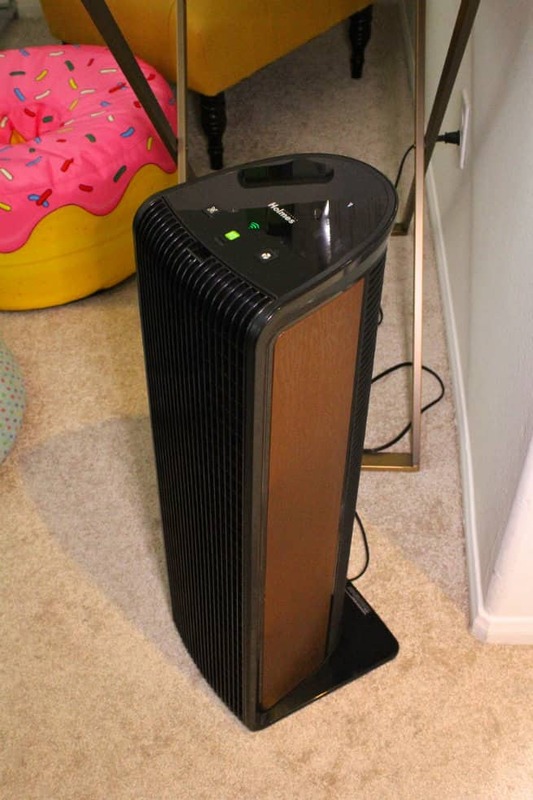 You can also schedule when your air purifier will turn on and off and work though out the week. You can set specific times and days. It’s all extremely customizable and very handy to have as every household and family is different. 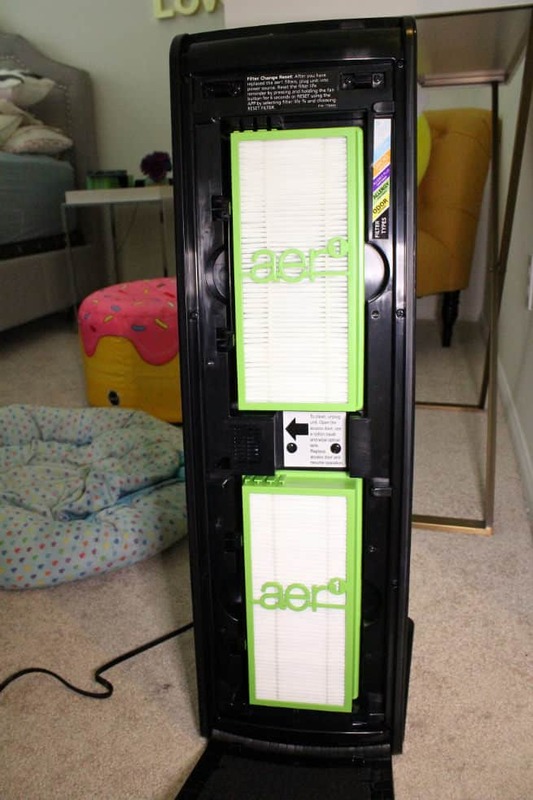 Being able to control our air purifier from any where is so convenient and it gives me the peace of mind to know that we won’t come home to tons of allergens in the air that will give us an allergy attack or worse. WeMo definitely comes in handy during life’s We Moments! A “WeMoment” is the feeling of relief in being able to adjust your technology to better your life. 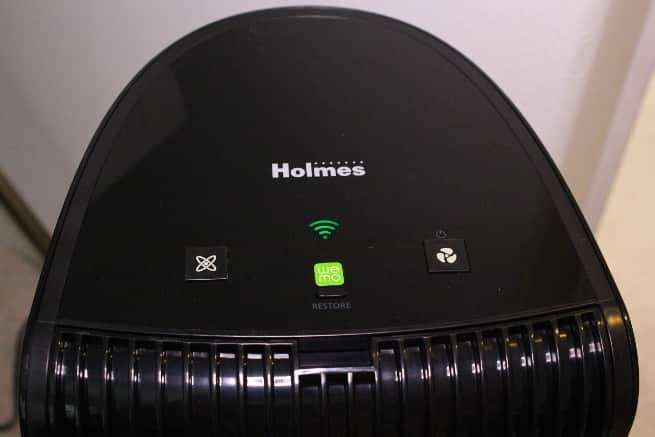 We definitely have many WeMoments now that we have our Holmes® Smart Air Purifier with WeMo technology. Want one of these for your home? 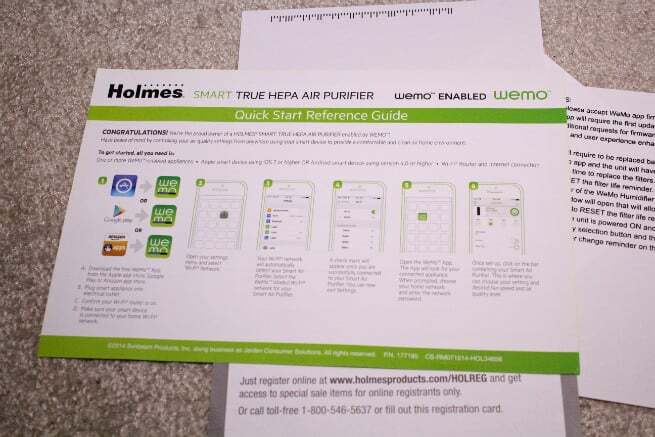 You can have the chance to win a Holmes® Smart Air Purifier with WeMo right here. Don’t forget to come back for your daily entries and to see who won within 48 hours of giveaway end! Good luck everyone! 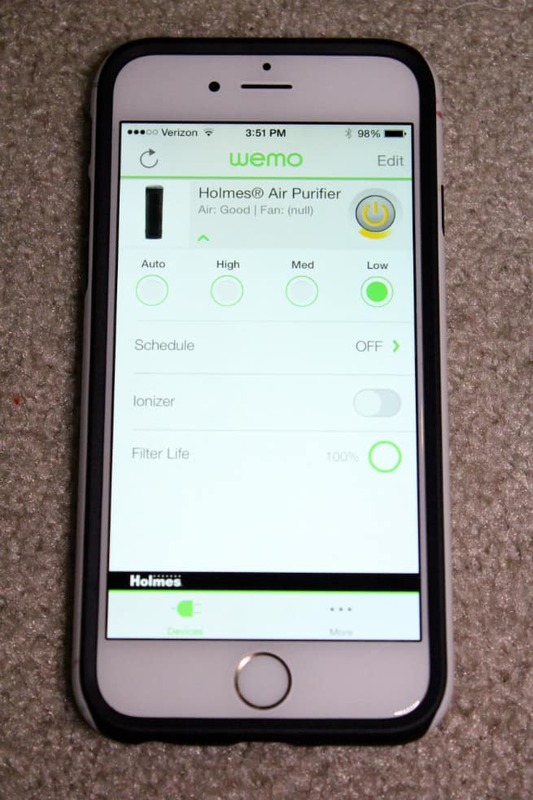 If you’re looking for a Air Purifier that contains some amazing smart technology I highly recommend the Holmes® Smart Air Purifier with WeMo. 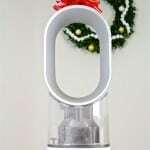 The Gift of Dyson For The Holidays! My WeMo is when my house is clean and tidy! My WeMo moment is when I can finally relax, and breathe when my allergies are in check, so this air purifier would help me have plenty of WeMo moments so i can breathe more easier and worry less. I control my electric blanket with wemo. My WeMo moment is my Leeo device in our home. It plugs in and notifies us through an app if our alarm is going off! It gives me relief because I know that I will be immediately notified if any alarm in our house is going off. My WeMo moment is when I can take a moment for myself and relax. My wemoment is taking time to decompress from a hard day. My WeMoment is getting to finally read in bed at the end of the day. My WeMo is my electric mattress pad. My wemoment is when the kids go to bed and I can remove the bra and put my feet up. I am off duty. My WeMoment is getting to the pool with the kids and then a whirlpool! My WeMoment is when I get out of the shower after work and lay in bed and unwind. My two fat babies (cats) and I really need this!! My wemo moment is that moment when I am drifting peacefully off to sleep. My WeMoment is when I set the thermostat to keep our house at a comfortable temperature. It’s hard for me to think of a WeMoment because I don’t have Wemo. I’m definitely going to look into it though and see what all it can do and if I can use it in my home. Hmmm…I guess a Wemoment for me was when I was able to set my coffee pot’s timer to have a hot cup ready for me when I get up in the mornings. My WeMoment is getting to finally read in bed comfortably. This would be a lifesaver! After moving into a home that had been empty for quite some time, we scrubbed and clean the house from top to bottom. Unfortunately there was so much dust and allergens that it led to numerous sinus infections for me and my family. It seems almost impossible to get away from all the terrible allergens whether inside or outside so my WeMoment would be breathing clean air so my family and I can be healthier and have more fun together. My WeMoment is taking a long bath after a stressful day. WeMo is my electric mattress pad. My WeMoment comes in summer when I can use the programmable thermostat to make sure the house is cooled down before we get home in the evening. My we moment is when I lay in bed after a long day of work. My WeMoment turning on the air purifier to avoid smoke and odors. At the moment it is very smoky where we live, it’s as if someone is smoking right outside the door and it is very suffocating. It will be wonderful to be able to turn on the air purifier and breath clean fresh air. My WeMoment is sitting down with a cool drink at the end of a long day. I’m not sure if I have a WeMo but I would like to! I don’t have many tech products like this. My we moment is laying in my bed with a book in hand and snacks on the side after a long day. 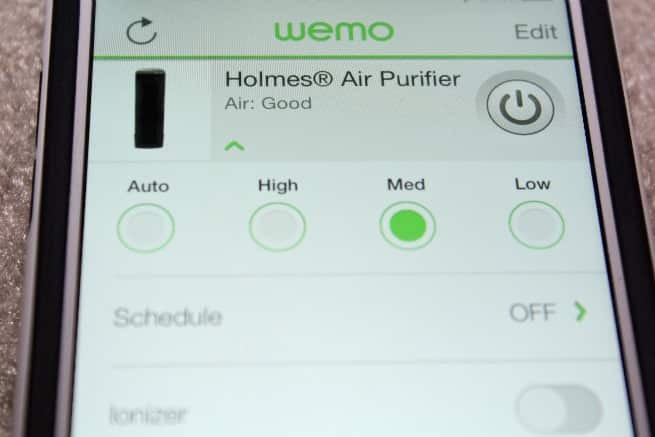 My wemo moment is when my allergies are under control and I can breathe easily. My WeMo moment is when I relax with a good book in the tub. My WeMoment is when i have the house to myself and the chores are done. It’s me time and i love it. My WeMoment is when i take 30-45 mins at night to myself. My WeMoment is reading a new good book! My WeMoment is when the kids are in bed and I can relax in front of the television with my wife. My WeMoment is after dinner and my husband and I sit down to watch our favorrite shows. My WeMoment is at the end of the day when I can binge watch Netflix and have a bite of chocolate. My moment is getting to take a nap. My wemoment is when the house is all clean and the kids are snuggled in bed and I can read for a hour. My WeMo is when the house is completely clean. My WeMoment is late in the day when I cab finally relax and lay down with my husband and snuggle up to watch some of our favorite tv shows together. My WeMoment is when we’re all cudding up on the couch relaxing as a family. My wemoment is reading in bed at the end of the night. My WeMo moment is when finishing grading all my students papers. I then kick back with a cup of hot tea and put on one of my favorite old time romantic movies.